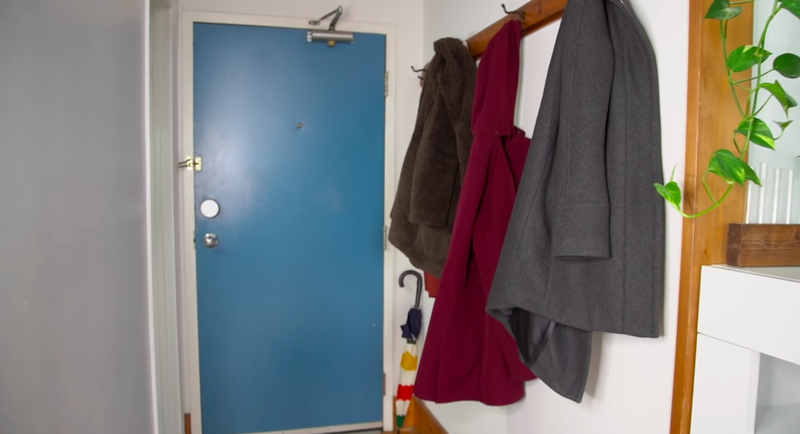 We started this diy coat rack by taking out our old rack and clearing out all of the coats and shoes! We started this project by creating a blank canvas on our wall. We patched and sanded a couple of holes, and gave everything a nice fresh layer of white paint. The next step is to build the rack! To limit the number of holes that went into the wall, we decided to have two vertical post pieces that get drilled into the wall, and then have all of the horizontal pieces attach to the vertical pieces! We mocked out our vertical pieces on the wall and decided how far apart we wanted the beams to be. We decided it would be easier to assemble on the wall, so we drilled everything together and then unattached the two beams attached to the wall to paint. We decided to paint the vertical beams white, and the horizontal beams black. Once everything was dry, we brought it back to the wall and reinstalled! Looks great! Once on the wall, we drilled some hooks into the beams at various heights to add some variety! To add some more space for our shoes, we cut a standard doormat in half and ran it along the length of the wall under the coat rack! We love how this turned out! Check out the video below for more!